Last night artist Andrea Francke launched a book – Invisible Spaces of Parenthood: A collection of pragmatic propositions for a better future – wrapping up several months of workshops, talks, DIY house-building, felt storyboarding, and other interventions at the Showroom art space. A few months ago, I went along and had really interesting discussions with Andrea about the visibility or invisibility of parenting and domestic work, and the opportunity to use DIY practices to rethink these. She had turned the Showroom into a library and workshop featuring How To manuals from the past 40 years, works of radical social theory, and lots of tools and toys to be used by people of all ages. Her book was meant to collect instructions that developed from work in the gallery workshop. I contributed this HowTO: Be a Writer (on parental leave). 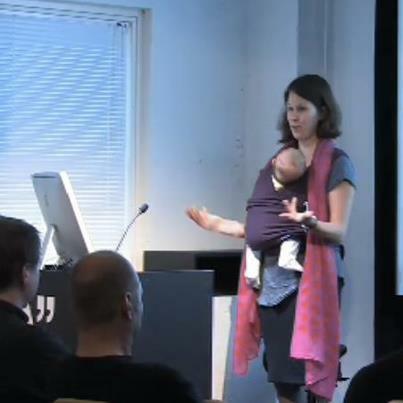 And in the spirit of Andrea’s launch talk accompanied by her son Oscar, I include this photo of a writer and her daughter, giving a talk at OKFest in September. DISCLAIMER: This was written entirely next to, around, over, despite, and because of a small child, who was three months old when the text was begun and four and a half months old when it was finished. Your results may vary. Before beginning, wait for baby to nap. Once baby is asleep, check the news, respond to correspondence, uncrease paper or launch software. Write a sentence. Erase. Adult lives are cyclical. Time to file the tax return, again. Another summer, gone. Baby lives are relentlessly linear. Very young people quite obviously develop and progress. They enforce narrative, even when we adults insist on the arbitrariness of narrative, on the fragmentary notion of story. Babies enforce narrative on our work. In shortened time scales, we demand progress. I rush to finish this sentence as I hear my daughter stirring, anticipating something new from her even as I demand something more, perhaps even more than I can give, from myself. You are walking, or I am walking. Perhaps it is raining, or very hot, or noisy, or an undistinguished day distinguished only by you (or me) walking through it with a baby in a carriage. You are invisible in this action, unless you happen to be a man, in which case you are visible only by virtue of your manliness, and only for a moment. Think. Think of all the ideas of your project, in no order, in rhythm with your steps. Think of writing the words you most want to use to tell your story. Imagine the pleasure of putting them together. This is the portion of work that is always invisible to creators. We think that work begins as we sit down to write or walk into the studio. In fact, we are working always, folding and refolding thoughts. Naomi Stadlen writes, in her book What Mothers Do, that part of mother’s (sic: parent’s) work is to be infinitely distractable. Hence, parents escape into imagination and reverie. Stadlen implies that this reverie is a consequence of distractable existence, and merely a phenomenon in itself. But for the creative parent, the writer-parent, the artist-parent, this reverie is lifeblood. In it we exist again as our singular selves, with our creativity freed to circulate towards the project we crave. Return home from the walk. Empty the dishwasher. Put some clothes in the laundry. Change the baby. Make a sandwich. Eat 3 bites of the sandwich. Pick up the baby. Think. Imagine writing. Imagine making. Sing a baby song, see a baby smile. Put the baby down, eat the sandwich. Hope. Baby sleeps. Or sits on lap, or feeds quietly. Snip. Write a sentence. Make a sketch. Capture an idea stewed at walking pace and in reverie. The creative producer, who used to be called an artist or writer, before neoliberalism reduced the world to the individual and the tasks that they might enact to fuel the system of supply/demand/discipline, is tallying her outputs. She is thinking of how to describe them to the grant agency or the hiring committee. Parental leave, she has heard, should be no excuse for a lag in production. The baby grows. There is always naptime. There are always the snips of time for drawing or writing. There is always the temptation to work, to feel connected to the cyclical narrative of project design, creation, delivery. So do nothing. Sit. Look out the window. Forget baby, forget project, forget work, forget progress. In capitalist theory, labour time is only valuable when it is used to create surplus value: Marx writes: “We should not say that one man’s hour is worth another man’s hour, but rather that one man during an hour is worth just as much as another man during an hour.” In that hour, the men must be making something that can be exchanged for something else. In this reckoning, baby raising time is no time at all. Creative time is no time at all. Since nothing you are doing is measurable by neoliberal metrics, do nothing. Forget Marx. What did he know? He had seven children and only 3 grew up. Can we assume that he did not worry about how to balance dialectical materialism with diapers? In any case, Marxist feminists encourage us to do anything, to think of our labour of production and re-production as valuable. Silvia Federici’s feminism angrily confronts the way that patriarchy categorizes women as “workers, domestic workers, baby-making wonders” (Power, 2009), and the way that some autonomous Marxist thinkers focus on the affect of labour, tinting some work with female qualities without considering the meaning of feminism. Affective labour refers to the labour of caring, the emotional work that smoothes interactions, facilitates flow. There is no reason why this labour is female, but it has been cast as such. Nina Power thinks that most work gets this ‘feminised’ cast, except perhaps artwork. “The female artist has an implicit double-job to undertake, if she is willing – to rethinking [sic] production and reproduction in such a way that the material and the immaterial, the personal and the objective. . . The work of the female artist is to go beyond ‘work’ as we currently understand it – the double-burden of which has characterized the lives of women for a very long time – to use artistic practice to rethink the notion of practice’. So whatever you are doing, it is work, but it is also art. Your child is art, your raising of it contains the opportunity for your most artful intervention in the universe. But the child is also anti-art, absorbing bodily and emotional attention that could be attuned to the turn of a phrase, the interpretation of a concept, the drawing of a scene. Art-making is the declaration that you exist as a subject, and not as the object of someone else’s art. Does it make a difference that you are one kind of productive subject as a parent and another as a writer? Step 7: Bake a cake? Wash the floor? Your house contains a kitchen and a studio. Knitting, sewing, baking and other domestic activities are not always visible or valorized – but they are also, fundamentally creative work. We can distinguish them from the other, endlessly repetitive tasks of housekeeping and childrearing, the diaper-changing, laundering, tidying and cleaning that constitute perhaps UN-productive maintenance work. The work of domestic creativity is now considered an aesthetic and artistic practice in its own right: witness the work of Fritz Haeg, who re-imagines domesticity and domestic artistry by self-consciously queering it, and self-consciously attaching this artful work to place and context. Claiming to engage with the locality and the seasons, Haeg’s work re-valorizes the domestic arts. But we have to ask the question (at least this question, in this moment, with the baby wiggling on the lap between the typing fingers) about whether this artistry re-valorizes traditional ‘women’s work’ or whether it only becomes valuable because it has been taken from the home to the gallery, and from the everyday to the sublime. Traditionally, crafts and arts were a way of making necessary ‘women’s’ work pleasant and aesthetic. The rise of ‘home economics’ as a form of scientific management of home-based work solidified the gendered aspect of this work, but also suggested that these activities could be studied and made scientific. In the decades that followed, second wave feminism invited women to embrace other kinds of work outside the home, and increased prosperity reduced the economic necessity for home canning, rug-making, knitting and sewing. Now, craft and DIY reappear as political acts, reclaiming the personal and communal in a neoliberal capitalist system that has separated effort, affect and creativity from production. This communal aspect has historical roots in activities such as quilting bees and knitting groups, but has flourished online too, through community sites like Ravelry.com and the hundreds of recipe sharing sites that proliferate on the internet. Craft slides in to art, and craft appears as well in a reinvigorated space for DIY practice that also includes new forms of craft commerce, like multinational Etsy.com or the ideosyncratic, local Night Markets. Craft is commerce, and craft is collective. Millions of people learn once again that everyday making has a beauty to it, and that everyday making is something done together, as a community and culture. Within these exchanges on making and practice are also the unofficial exchanges of tacit knowledge that helps the banal bits of everyday life proceed (or indeed, the artful act of childrearing). What do other people do in order to work? As a parent, you recognize the importance of these tiny pieces of knowledge, and as an artist you recognize the silent, often unmeasurable influence of the collective, of the longer, larger conversation about ideas of which they form a part. But you have to ask: does the banal, quotidian exchange about washing powder have the same force as the exchange about theory? The critique of most recent practice? Step 8: Do what can be done. You have been for a walk. You have changed the baby. You have read the philosophers. You have examined your subjectivity. You have considered the broader consequences of your work. Now you will try to put on the radio, pick up the cup of tea, put the baby on your lap or under the table or on the playmat in the studio, and do whatever it is that can be done. Your attention is not perfect. Your production is slower, you feel, than it was without the tiny person squirming in the corner or calling from the next room. You are divided. But you are also more than your practice, more than your parenting. You are – that is, I am – more than one kind of subject. I knit together more than one kind of knowing. I have more than one kind of attention. I am a different kind of creator than I was before. And in the knowledge of this, I will do what can be done. Nina Power One-Dimensional Woman (2009) Zer0 Books. Naomi Stadlen What Mothers Do. (2004). Piatkus Publishers: London. Alison Powell is a writer and scholar. She is a Lecturer in the Department of Media and Communications at the London School of Economics where she studies media futures and ‘critical making’, and from whom she received paid parental leave which she used to write this article. Baby H lives in South London. She likes baths, trees, and singing. This entry was posted in Uncategorized on October 25, 2012 by Alison.